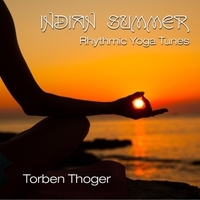 Click picture above to download "Indian Summer: Rhythmic Yoga Tunes" from iTunes! These 80 minutes of beautiful rhythmic yoga music without interruptions, is perfect for any listener or dancer both at home or at yoga classes. The intuitive and soothing melodies are wrapped up with intensive rhythms and will appeal to both an Asian and a Western audience. Although the inspiration on this album is Indian, the instrumentation and the arrangements are a mix of different styles, which is something the artist Torben Thoger is an expert in. Torben Thoger is an award nominated Danish composer, song writer and recording artist. Torben has released several albums in the New Age genre and his music has been on top of the charts in the United States and in India. "The Light Connection Magazine" states that Torben Thoger fuses genres with an angelic torch and his arrangements invariably offer a musical experience unlike any other. "AllMusic.com" calls Torben's music truly fascinating and otherworldly.